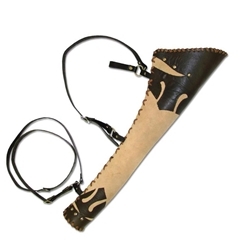 Ranger LARP Quiver is a highly adjustable leather archery quiver designed for carrying larp arrows. Made from chrome tanned leather with a soft suede leather exterior. Elven style leather patches decorate this quiver at the top and bottom. The circular bottom and side of the quiver is laced with flattened leather cord and brass rivets are used to attach the leather straps. The Ranger Quiver can be worn over the shoulder thanks to its 35.5 inch adjustable leather strap with brass-plated iron buckle, and 32 pre-punched holes. An additional 27.5 inch adjustable belt secures the quiver around the waist. There is even a loop for attaching the quiver to your waist belt for side carry. This quiver is an essential piece of equipment for the LARP (live action role play) archer. Great for theater props, cosplay, Halloween, Renaissance faires.